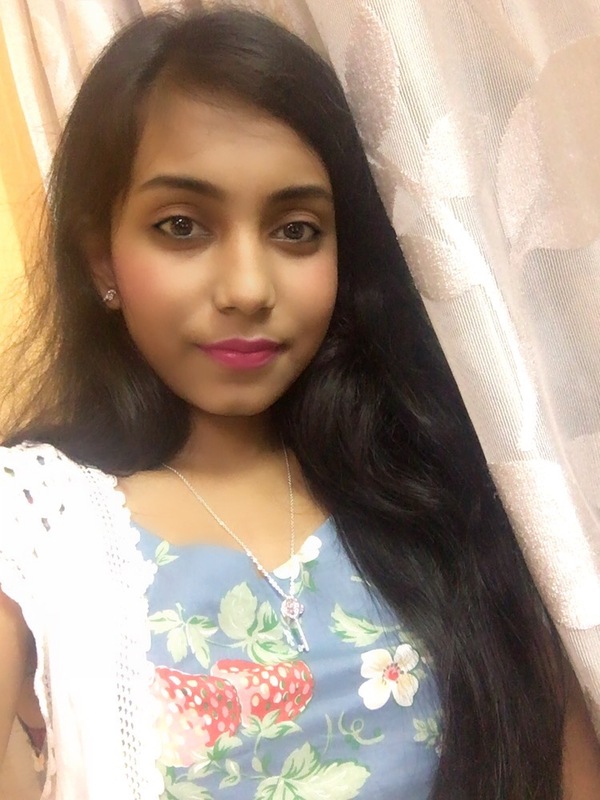 You might have a busy life or you are simply lazy, or maybe you are from a city that doesn't have your favorite brands or a market like Sarojini, well online shopping is the solution to all your problems. Me being a lazy shopaholic, very much spend all my money on online shopping. It's a beautiful feeling. Waiting for the package to arrive and opening the box of joy just like you open a birthday present. But it is not always the box of joy. Sometimes it is the box of disappointment. And it feels terrible. Online shopping is definitely a blessing but we need to keep few things in mind to have a good shopping experience. After so many years of online shopping, I can say I am experienced and somewhat expert at it now. So I decided to share with you all the lessons I have learnt so far. It is very important to choose a good and trustworthy website or app. You will find numerous apps and websites but if you are new at it you should play it safe. A user friendly website with proper information about return, refund and exchange and contacting details is important. There are a lot of websites which do not have any contact number neither do they mention about the policies clearly. It might seem unimportant at first but when you receive something that disappoints you, you will go back to the website only to get more disappointed. I believe if you are shopping online you should not spend too much on a single item. If you want to buy something expensive, go to the store (Taking into consideration you have that option). You should take online shopping as a chance to explore different brands or designers (who are probably not even famous but make great stuff) and add variations to your wardrobe and also experiment with different styles without spending much. And if it's your first time at an app, then do not buy more than 2-3 items at once. Do not stop after scrolling for 5-6 times. Online shopping needs dedication. You might find something really amazing right at the end. Now there maybe a thousands of products and after a certain point of time it gets really frustrating. So what you can do is use the filter or sort out button. The first thing you should do is choose the size. That way a lot of items which are not available in your desired size gets removed. Even though filtering size does most of the work, you can filter the price to choose an item at your budget or filter the colour, type, length etc for better and accurate results. The first thing you should do is zoom it and see. A lot of times I did not like the item after zooming it. The next thing you should check is the product details. For example some items look like cotton until you read this part and find out it's polyester. The next thing is to check the size chart. The sizes vary from brand to brand. So if the item you picked is from a brand you never bought before check their sizing. I have had problems with shoes a lot of times. So you should know the length of your sole in cms and check the chart. 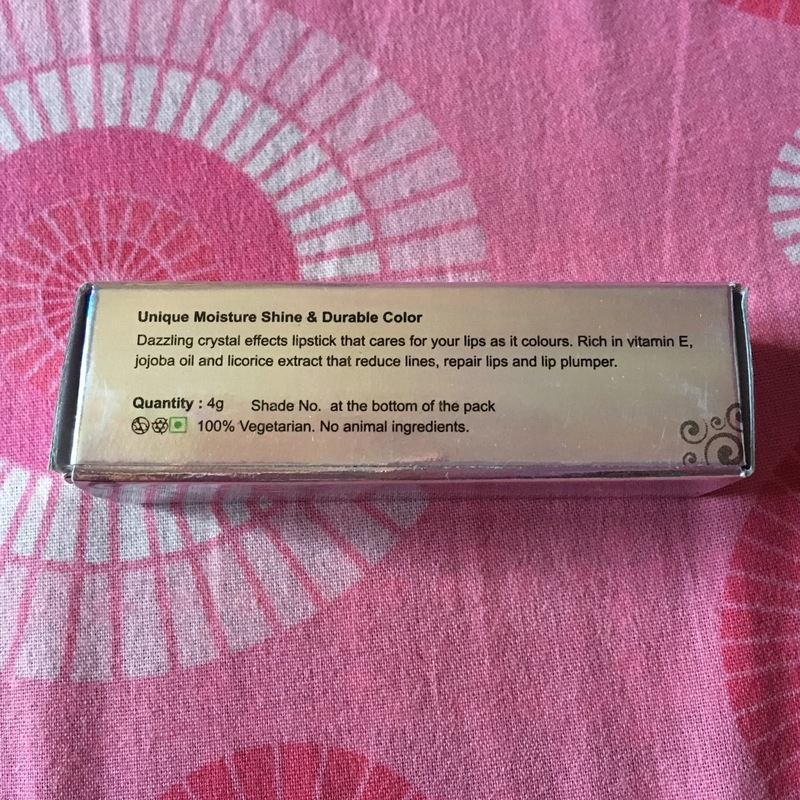 And finally read the product review by other buyers. You should check your pin code if COD is available. I think COD is better and more convenient but I have never really faced any problem with cards either. But if it's your first shopping then COD is better. Almost all Indian sites have an option for COD. But cards are better if you want a refund. That takes me to the next point. Before placing the order, check the return and refund policies of the website. Some websites won't pick up from locations where they would otherwise deliver. If you are not happy with the product you probably have to go to the post office and courier it yourself and you obviously don't want that. If you have sizing issues then you can just exchange which is pretty much simple. But other than that you have no other option but to return and get the refund. With COD as your payment method you either have to get the credit in your shopping account or you have to give bank details and stuff for getting a return. I think this is sort of complicated. So with card they just return you the money directly on the card you paid with. So that's one advantage of using a card. If some websites do not provide provide proper information but you really want to buy something you liked a lot, you can call them up and ask your doubts. Some even initiate returns only after calling them and asking for it. Usually most of them deliver pretty fast nowadays but some just don't in spite of promising a fast delivery. So check with their website. The popular shopping apps are really fast. You can count on them. Almost all of the shopping apps have some kind of discounts or the other. There are coupons that may not be showing in the app but if you google you'll surely find something. So just look for them because even a 10% discount is better than paying full. So it's my birthday today and I turned 21. Woohoooo 💃🏻 (Wait...am I supposed to start hiding my age from now on??!!) 🤔😂 It kind of feels weird growing up so fast. I am excited as well as upset. My semester exams are going on and I don't think I'll be able to celebrate. Even though I went to give the exam in new clothes and did a little bit of makeup (I usually look like a zombie in college every other day) but that's where it ends. Anyways I wanted to share my look from that day here in this post and maybe write another post on turning 21 because there's so much I have learnt in the last one year. But anyway let's talk about the outfit now. Whenever I think of birthdays the only kind of look that comes to my mind is something that is classy and royal. Something that is princess like because you feel like a princess..so so special (Even though I feel like one everyday). 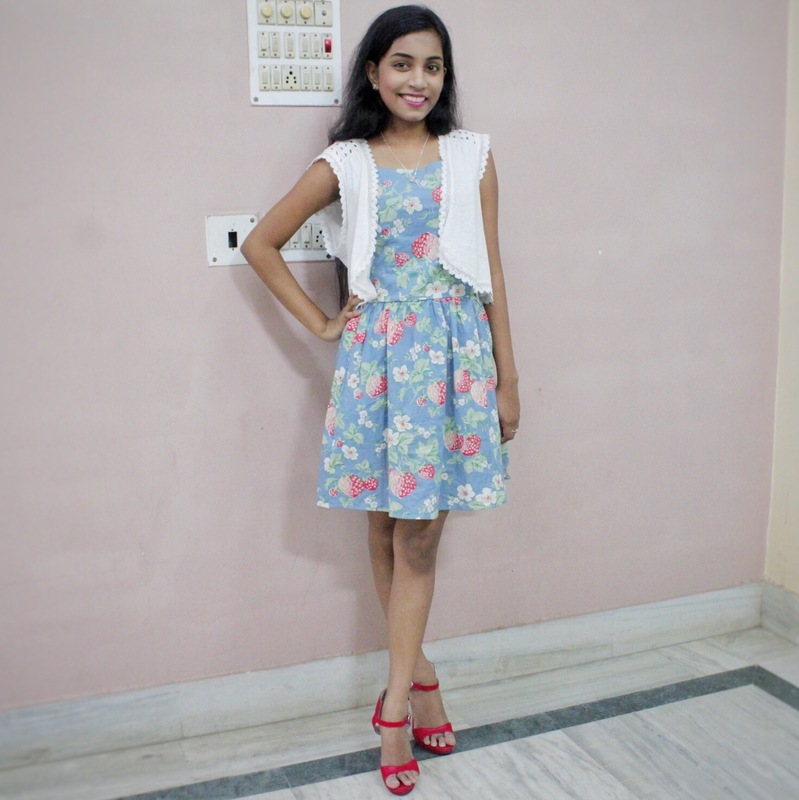 Since I have been called a daddy's princess all my life and my dad thinks I love pink and white (Read this to find out what I am talking about), I decided to wear this outfit. 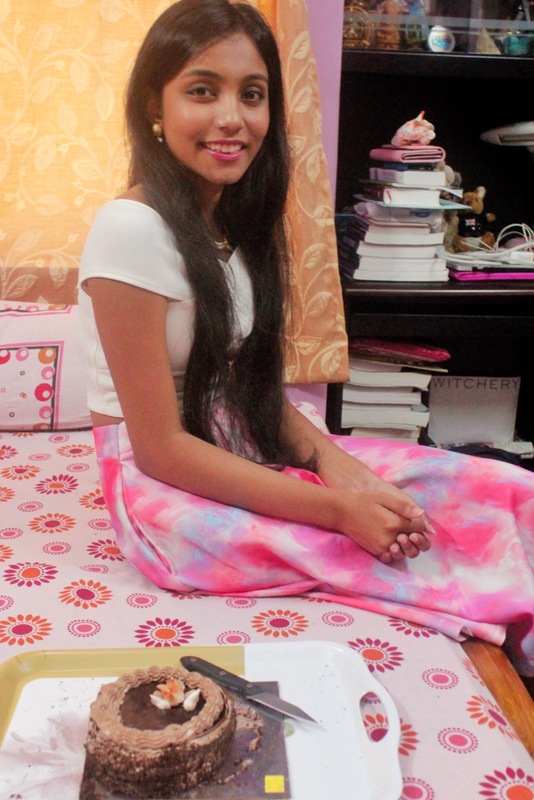 I got the midi skirt from Koovs while it was on sale. I am literally obsessed with midi lengths. And this skirt is really very elegant. 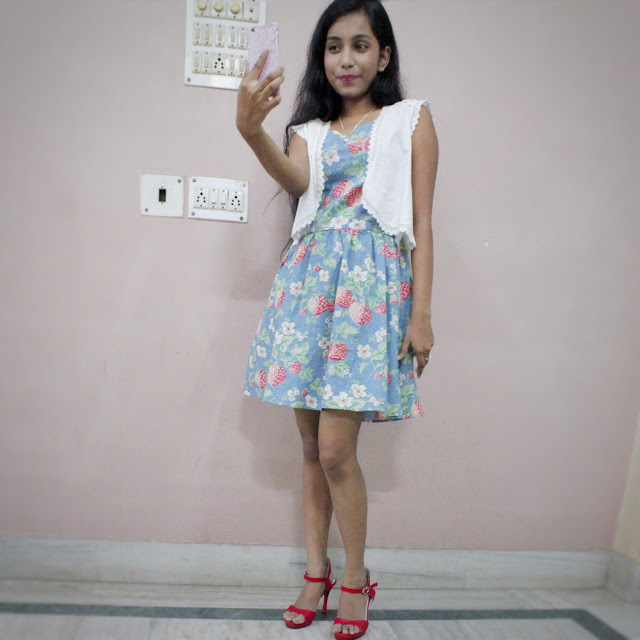 I paired it up with the off-the-shoulder top which I ordered from myntra (well it was a last moment order and I just got it the day before the party. I was ready to postpone my party if this didn't come on time😜 ). And this top seemed to be the perfect match for the skirt. 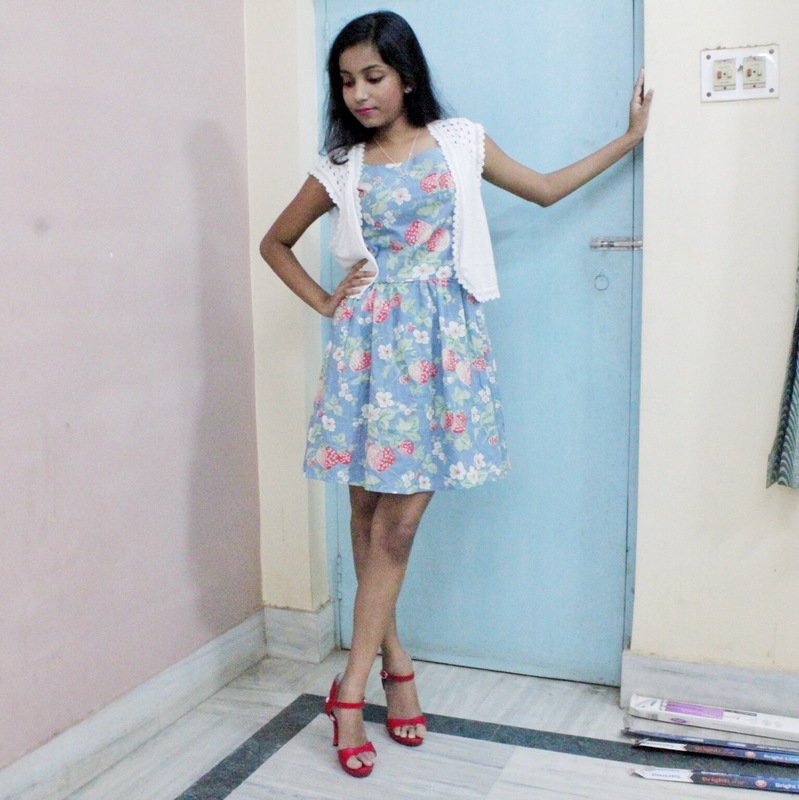 I wore a pair of pink suede heels with small red floral prints on it. And accessorised with a set of pearl neckpiece and earrings. 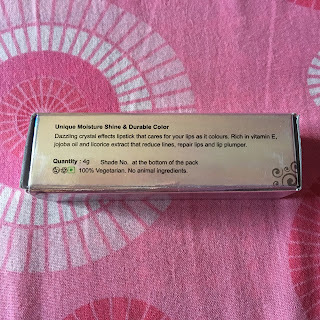 As I mentioned in the post on my first shopping experience with Nykaa (Click here to read it), I wanted to do a review on the products separately. I was hesitant at first because honestly make up has never been on the list of my good qualities ( I can only do the basic). But I badly want to make it one of my good quantities now. So here's how I start working on it. And I also convinced myself saying that a review is sharing your personal experience with your readers. So study it, experiment with it, understand it and write about it. Simple as that. 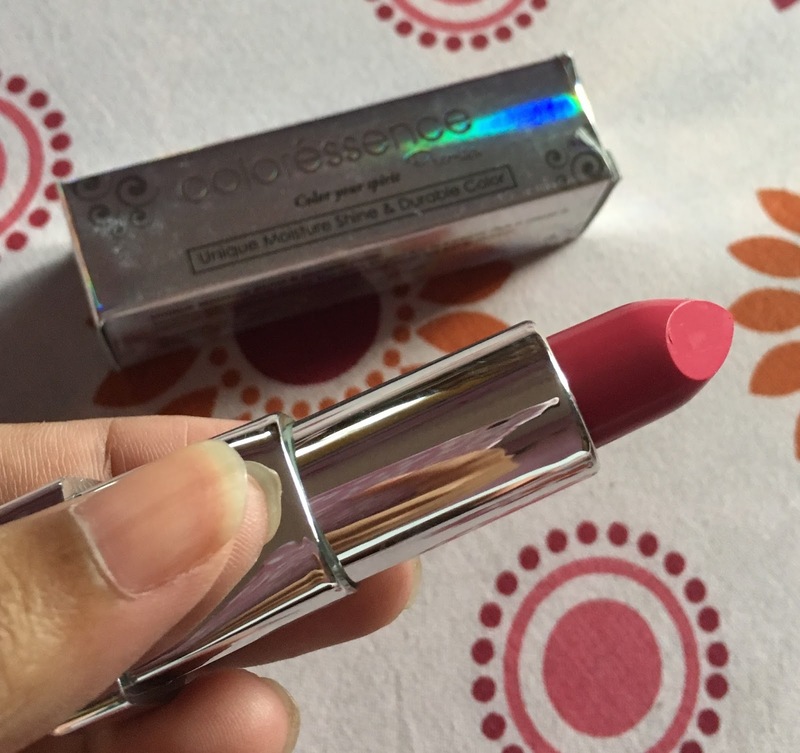 As in most cases, the first make up product a girl begins with is a lipstick, I decided to review the Coloressence Premia Bamboo Pink lipstick which I have been using over two years now (See I chose a safer option :P). So it comes in a silver, shiny, thin cardboard box with the the ingredients, price and other details printed in black. The body is silver and reflecting made of light plastic material. The cap covers the whole of the body. It is strong and sturdy and closes with a click. The color is one shade lighter than the colour of the bullet (Personal opinion). It's a very pretty shade of pink which can go with any skin tone. It goes perfectly with the girl next door looks ( No wonder I wear it a lot). 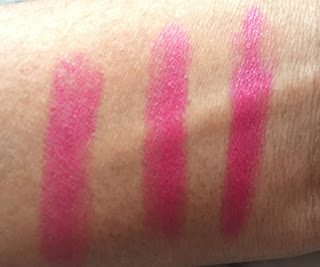 If you see the swatches you can see it's pretty much the same with one stroke or three. But it becomes a bit cakey in the third stroke. So I would recommend going with two strokes. It is not very smooth to apply. If you are applying one stroke you can only do that with a lot of difficulty. Easily removed without leaving behind any stain. Although after removal, the lips feel dry. The lipstick has a good staying power. Does not bleed or transfer even after meals and drinks. In fact I personally feel it looks better after a while and it looks more matte. 2. Good option for a beginner. 4. Pretty colour going with all skin tone. This is my third buy so you know my answer. Even though it is the beginning of fall, Kolkata, as always, is madly in love with summer and it's humidity. So bong girls tend to have a lot of cotton, light weight, easy breezy materials. 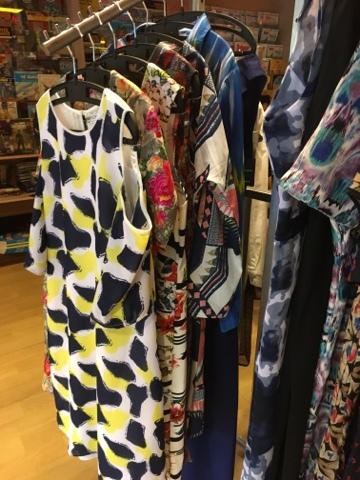 Summer dresses, bright colors and awesome prints are our go to. If you read my earlier fashion posts you pretty well know I have a weak spot for all sorts of prints. 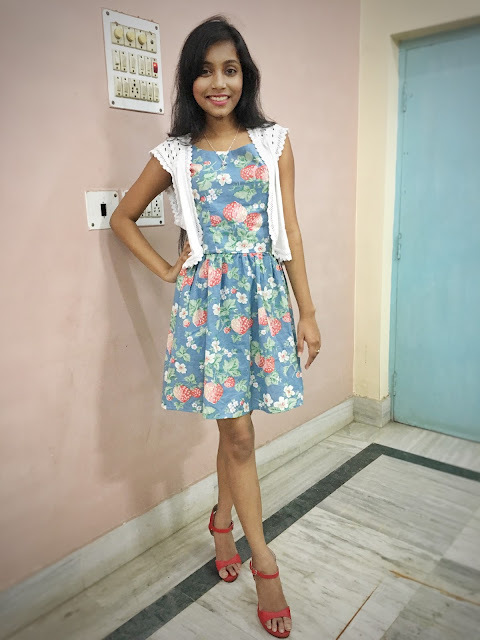 I had this comfy cotton strawberry print dress for quite sometime now so I decided to wear it in a small family get together. 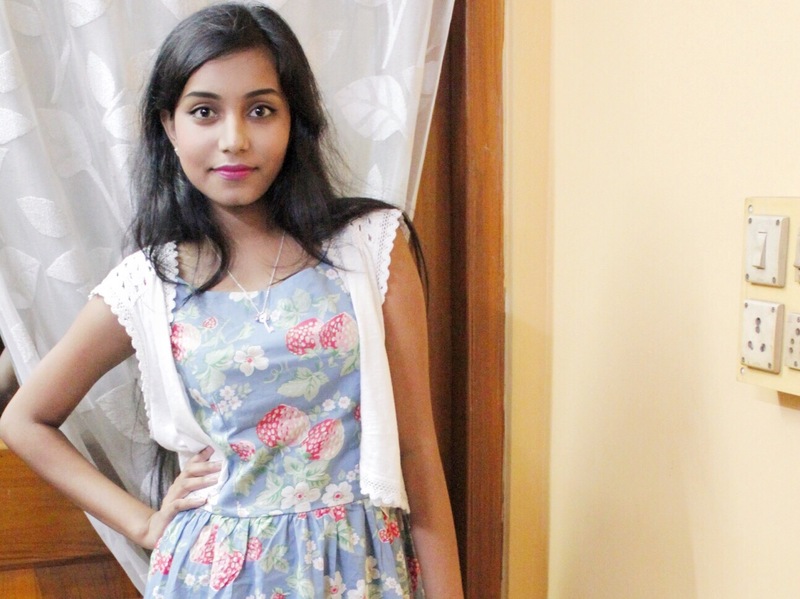 This blue dress is pretty casual with very cute strawberry prints. It has a country girl vibe to it. So I paired it up with this white shrug with the crochet detailing. I wanted to keep the look very simple so just added a pair of red open toe pumps and a cute key pendant. 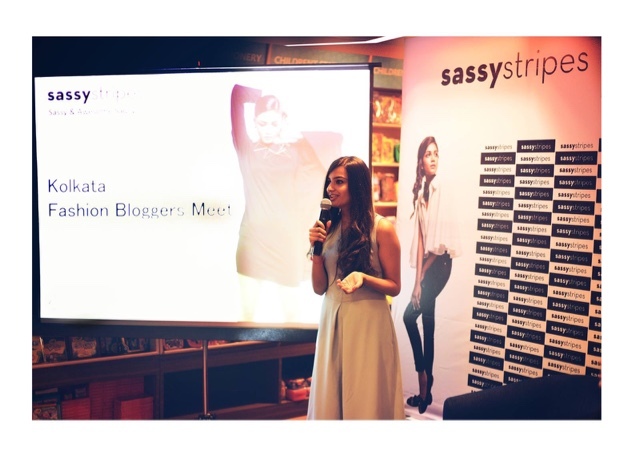 So as you all know last Saturday I attended the fashion bloggers meet by www.sassystripes.com . 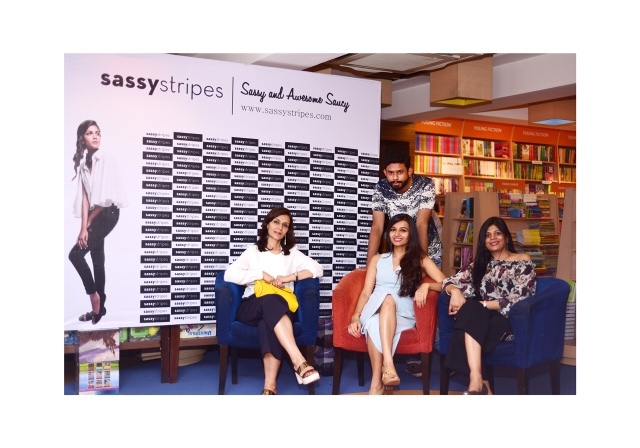 It's a newly launched shopping brand which provides women with exactly what they want, "Squeaky clean class with a bucket load of sass." So let me tell you a little about how it all started. 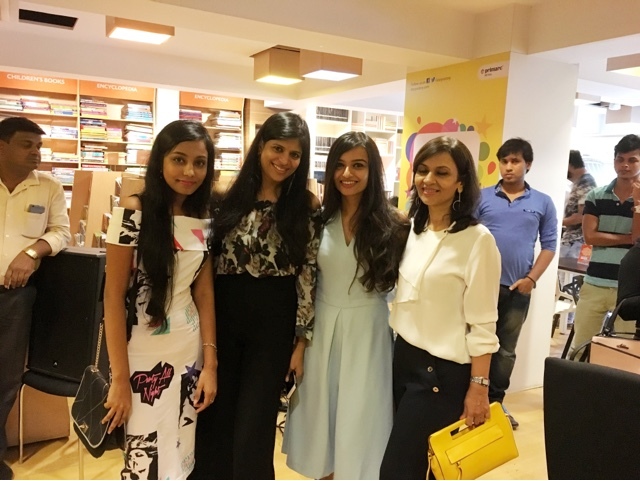 There are three founders behind the amazing brand, Karishma, Pooja and Monika. You can see it is completely a women driven brand. And it's a great plus point since only a woman can understand the fashion needs of another woman. So I totally love what they are doing. They are a great source of inspiration. And what I love more about them is all the three of them are from three different age groups. So their clothes cater to the needs of women of every age group. 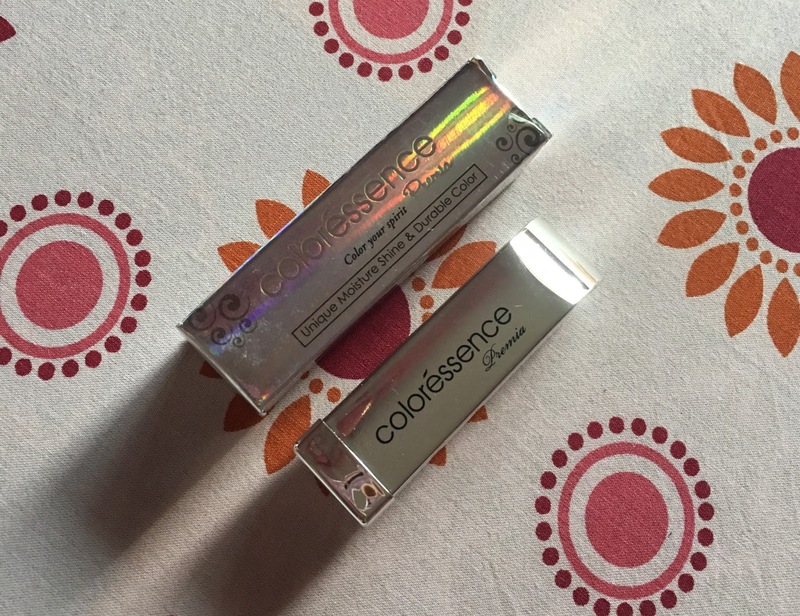 They launched their brand last year in the month of november and their journey has been great till now. You can see the sincerity in their work. As Karishma said, when we buy from websites which sell you products at Rs. 499 or 599 each, many of the times the trend quotient or the quality is compromised. 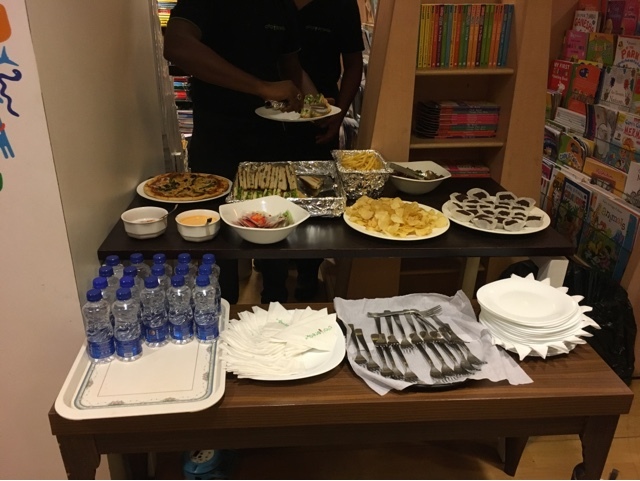 So if you have a special occasion coming up where you don't want that compromise, you have to rush to the stores. 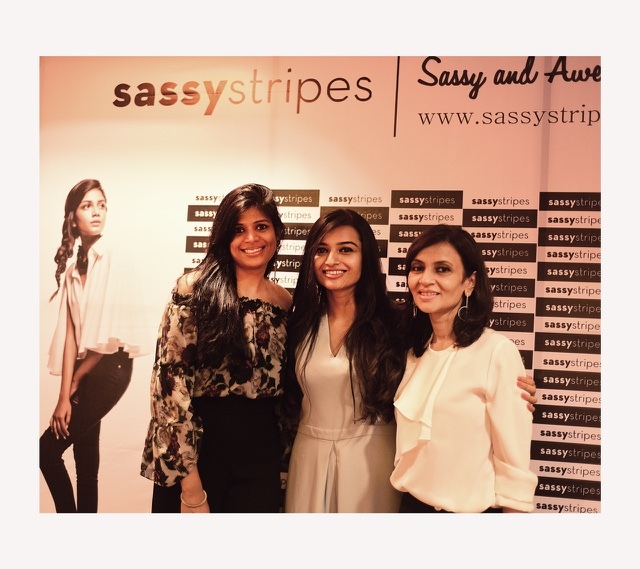 So Sassy stripes provides you with the high street quality products at your doorsteps. The price range is from Rs. 899-2999 which is pretty affordable. 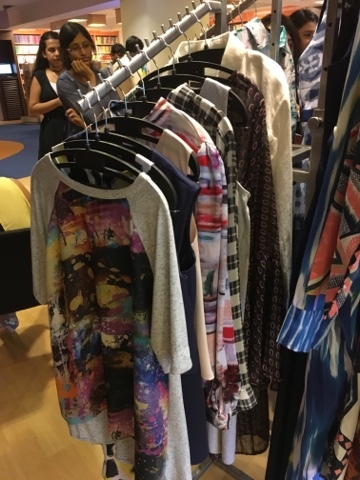 The fabrics they use specially for the bodycon dresses are imported. So the price is pretty fair for the quality. Now let's come to the design part. 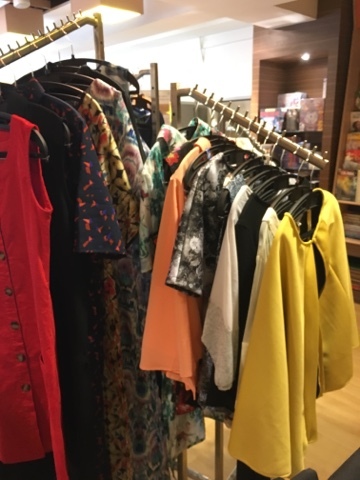 Their style of clothing are inspired from the designs at fashion weeks. They have blended the trends with their own style which you can wear in everyday life. I went through the clothes they had on display and they were actually amazing. The quality, the trend, the style, they actually deserve a space in our wardrobe. I pretty much loved all the outfits. 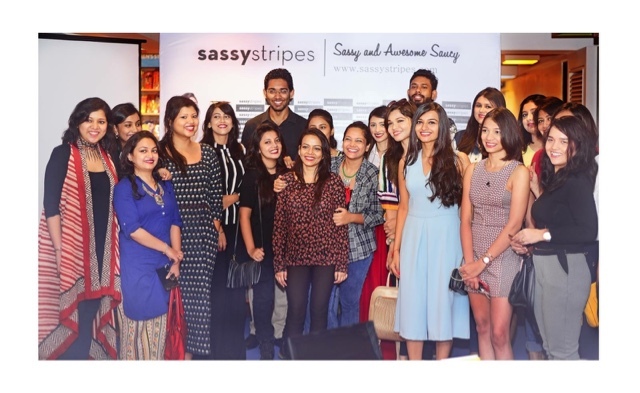 I am so thankful to Kolkata Bloggers for introducing me to sassy stripes and some amazing fellow bloggers. I got to meet some really awesome people and learnt a lot. And finally finally finally the photographer managed to take a good picture of me with the sassy stripes background. Yayy!! Okay now let's come to my favourite thing in the whole world. Discount!! you get a 15% discount on all their products using the code. So here's the link (Click here) and grab your piece of sass right now.